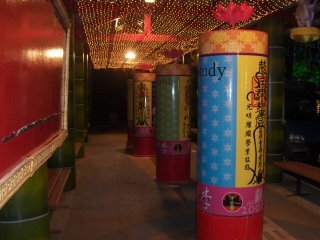 I think these are prayer wheels. You spin them and ask for whatever they represent. When I came back up here with Jennifer, Stephanie and JB, we spun all of them many times. They say things like "Study" (education), "Wealth," "Healthy," "Safeness" (safety), and "Filial Piety".... ahem. Given that I neither have a son nor am I son I had to pray really hard for that last one!